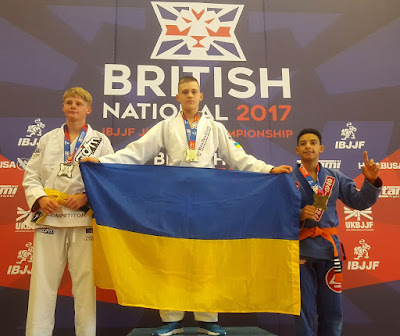 The fighter of SC Borets/ ZR Team Kropivnitsky Serhii Krasovskyi showed great results fighting during the championship which was held in the UK. Serhii Krasovskyi won a gold medal in London. Serhii prepared hard for this fight thereby he successfully represented Ukraine on the high European level. The fighter started to show his professional skills from the first seconds of the duel. He used his favorite berimbolo technique and got into the leg drug position. After he made leg drag guard pass. Krasovskyi wasn’t fast in this duel and tried to concentrate his weight. After the pass, the fighter had taken the position, took back and finally applied the technique of strangulation with lapels. Serhii once again proved his Brazilian Jiu-Jitsu skills.